A local news site reported recently that the Post Road strip mall by North Maple Avenue — the one with Dunkin’ Donuts, a cleaners, tanning salon and much-loved Layla’s Falafel — would be torn down. Not true. 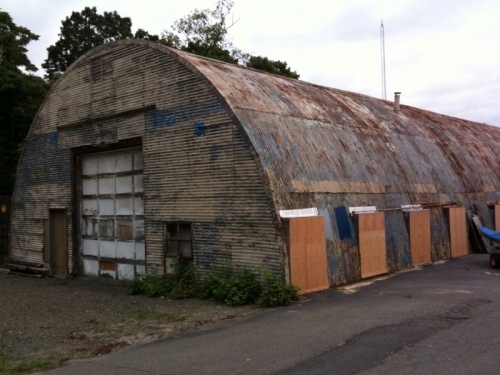 The demolition permit is for the hideous Quonset hut that has hulked behind it for decades. A paint job in 2010 made it look at least a little more presentable. So the strip mall will remain. It’s one of our many mini-shopping plazas. KFC — or “Kentucky Fried Chicken,” as it was known then — was not the only quick poultry place in town. Downtown, in Brooks Corner, Westporters enjoyed Chicken-a-Go-Go. And yes, as the name indicated, they delivered. This entry was posted in Friday Flashback, Local business, Restaurants and tagged KFC< Quonset Hut, Layla's Falafel. Bookmark the permalink. Hey, no hatin on the Q hut, man. I’m sort of pretty sure that was associated with the Army’s Nike missile operation. I grew up on North Maple Ave., and am 65 years old. The Quonset has been there as long as I can remember. I especially loved the tilting KFC bucket! 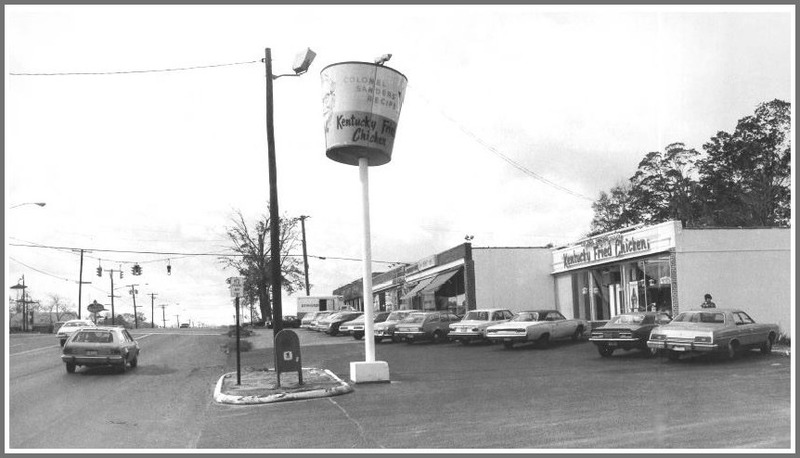 I don’t know if you’re old enough to to remember Mac’s Meat Market that was located where the dry cleaners are today. North Ireland-born Mac McCarthy sold premium meats and served up generous quantities of anti-Irish Republic invective. I remember Mac’s well. He gave free bologna slices to the little kids (like me). A true butcher shop. Along with my good friend Eddie Gustafson, I worked at that KFC as a cook in the late ’60s. It was affiliated with another one on the Post Road just across the border in Norwalk. We had a lot of fun! In the 50’s, there was a pet store. If memory serves, it was called Bob’s Fish Store, but I remember getting scratched by a chimpanzee they had there. That KFC pretty much seemed like exotic food for me growing up. Back in the day… That Quonset housed a junk (er, I mean Thrift) store. I was living within walking distance at that time. I love the hut and wish it could be put to good use. In the very early seventiess we looked into making it our Westport Senior Soccer Club “headquarters”. Westport Fairfield Piano, the Steinway dealer in those days, where I met and was offered a job by Mortimer Levitt, was next door to KFC. Across the street was property owned by the great Joe Cuseo including Charpentiers,a real fresh meat butcher shop and Hammond Organ Studios. Up the Post Road a little was the Bowling Alley and golf driving range including miniature golf for the kids. To my mind that was Westport at its best. Loved the bowling alley and most of all the golf range where I learned how to swing a club! As for miniature golf – do kids do that any more? Kids really do enjoy mini-golf (as it’s called now). At least, the Staples HS boys soccer team I coaches do. The closest facility is in Norwalk, by Calf Pasture Beach.